1. 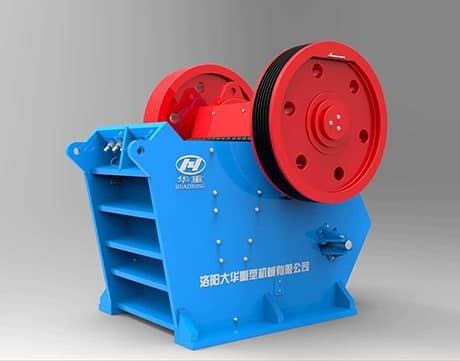 The jaw crusher is whole set offered by assembled of factory and trial run unloads. The user must check the amount after receive this product. In order to discover some problems that form conveyance. 2. Because this machine has a bit strong vibration, it must install the ferroconcrete base. The weight of the base is 8-10 times than this machine. The depth of groundwork must deep than the deep of ground freeze. The base of chart offered dimension is main and electromotor ground bolts comparatively distance and other parameter.lt must set aside aperture in order to install the ground bolts.lt used second grout in basis. The high of drag trough and bulk is decided according to locate. 3. In order to lighten vibration, at the second grout in time, it must not less than 10mm rubber of other amortize material between crusher and baton, after the cement curdle of second grouting screw down ground bolts. In this process must determine level degree with gradient, the warp of level degree control below 5mm. To check up machine frame' level degree is very important, it can make sure not appear unilateral feeding in working, and avoid shatter machine because burgher odds. 4. Install the electromotor, not only inspect the distance with main, but also inspect electromotor' strap wheel and main trough wheel' plane isn't on one plane. Make sure all triangle strap wheel effective working. 5. The size of discharge open adjust according to the product' granularity and disposal capacity. You should disentangle spring before adjust discharge open. After adjust, propriety adjust spring tighten degree. a. Continue movement 2 hour, axletree temperature hoist less than 30℃. b. All clamping fastener must fasten. c. Grooved pulley and move fly wheel calm. d. All the part of rub haven’t abrade and rubbing; haven’t abnormal noise. e. Discharge open adjust range must accord with request. a. Crusher hasn’t periodicity or prominence sound. b. The biggest size of the feeding material must accord with request. Continuous movement 8 hour, bearing temperature hoist cannot exceed 30℃. Next Article: Why High Efficiency Complex Crusher is called High Efficiency?